Among the early settlers of Gastown and Vancouver were Francophone hoteliers, shopkeepers, teachers, entrepreneurs, engineers, and many others. They came from eastern Canada, France, Belgium and Switzerland, and they formed a linguistic community in the new town. This walking tour will take you through Gastown and the Downtown Eastside to see where some of them set up their businesses, and where some changed the landscape of Vancouver. Maurice has been involved in culture and heritage for almost thirty years and is active in the local and national Francophone media as a spokesperson and chronicler. $10 for non-residents, pay-what-you-can for local residents. 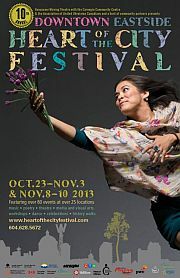 This event was on Day 12 of the 12 Days of the Heart of the City Festival. Please check the website for more events!